Fitxategi:Venus Tablet of Ammisaduqa.jpg - Wikipedia, entziklopedia askea. Aurreikuspen honen neurria: 355 × 599 pixel. Bestelako bereizmenak: 142 × 240 pixel | 285 × 480 pixel | 356 × 600 pixel | 455 × 768 pixel | 607 × 1.024 pixel | 1.627 × 2.743 pixel. English: Venus Tablet of Ammisaduqa. Neo-Assyrian period. 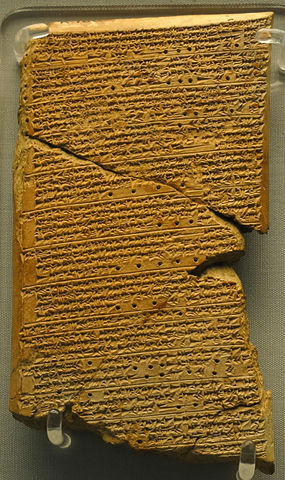 Detailed description Upper part of a clay tablet, 3 pieces, beginning of obverse and the end of reverse are wanting, astrological forecasts, a copy of the so-called Venus Tablet of Ammisaduqa, Neo-Assyrian. ~ Description extract from BM record.